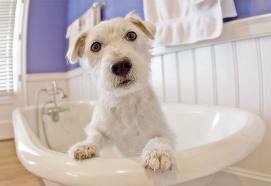 Dr. Andy Michaud realizes how important grooming is to the health of your pet, and has provided his clients with an in-house groomer. Ever since Kathy joined our clinic she has proven to be the best. She is a professional master groomer, has completed her 900 hour certification at the Florida Institute of Technical Arts, and has over 10 years of grooming experience. She generally has same day appointments available and plenty of love and patience for your pet! Kathy is here during our normal business hours and appointments can be booked through our receptionist. Every dog and cat, regardless of size, breed, age or coat type, needs to be groomed on a regular basis. 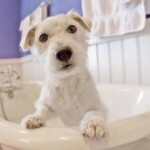 Grooming is more than just a “beauty session” for your pet. Grooming is an essential part of your pet’s health and physical well-being. Dogs who are consistently groomed tend to have a better and shinier coat simply because the act of brushing and combing the dog’s hair stimulates the blood supply to the skin, thus enhancing your dog’s health. Regular grooming can prevent problems such as excessive shedding, skin and paw disorders, painful mats, and bad breath, as well as help you identify other problems that might go unnoticed without the extra attention.